There’s a lot of news below. We’ll be tabling at the Empire State Plaza on Thursday and at the Albany Book Festival on Saturday. Stop by and say hello! Sunday, 9/30: A new Literary Libations tour! Do you have your Gala Tickets yet? Frankie Bailey’s detective novel, The Red Queen Dies takes place in and around real places in Albany. 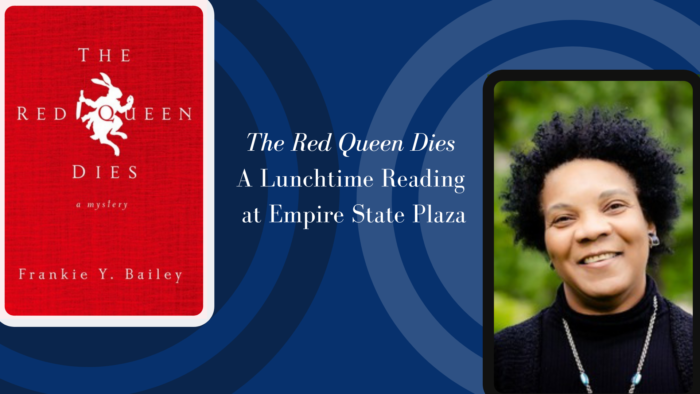 On September 27th, come hear Chapter 16 of The Red Queen Dies read on location at the Empire State Plaza Concourse. Stop by anytime. Chapter 16 takes less than 20 minutes to read and we will be reading it repeatedly. When two women are murdered in quick succession, biracial police detective Hannah McCabe is charged with solving the case. In spite of the advanced technology, including a city-wide surveillance program, a third woman is soon killed, and the police begin to suspect that a serial killer is on the loose. But the third victim, a Broadway actress known as “The Red Queen,” doesn’t fit the pattern set by the first two murders. With the late September heat sizzling, Detective Hannah McCabe and her colleagues on the police force have to race to find the killer in a tangled web of clues that involve Alice in Wonderland, The Wizard of Oz, and Abraham Lincoln’s assassination. The New York State Writers Institute presents the Albany Book Festival, a high-profile, broad-impact, family-oriented celebration of authors, readers and books. The festival will kicks off Friday night with the presentation of the NY State Author and State Poet Awards and a public reception. On Saturday, September 29th, the Albany Book Festival will bring together dozens of acclaimed authors for a series of panel discussions on a diverse range of genres including mystery, history, memoir, and food writing. Bookstores, publishers and literary organizations — including the APL Foundation and Friends of APL — will be tabling in the exhibit area. The Albany Book Festival will be held in the University at Albany’s impressive new Campus Center expansion, which includes a grand concourse, 380-seat auditorium, multi-purpose rooms, conference areas, courtyards, a Starbucks café and a dozen food vendors. It will bring together our 18,000-student campus and the Capital Region community in an exciting new way. This year, we are celebrating the South End where the Howe Branch is located. And so Maeve McEneny, the leader of our wonderful Literary Libations tour, has been putting together a South End spirits tour. This event is presented as part of Discover Albany’s “Tastes and Traditions” program, highlighting unique culinary traditions of our region. Click on the image to GET TICKETS! The Friends and the Foundation have moved into our new office in the 3rd floor of Washington Ave. All Friends members are encouraged to come visit sometime! And Lex Bhagat, Foundation Executive Director, and Gene Damm, Friends President, will be tabling together this weekend at the Albany Book Festival. Come say hello to them, and let them know your ideas for the National Library Week lecture — the first collaborative program of the Friends and Foundation! The Albany Public Library Foundation provides critical financial support to the Albany Public Library in order to help the library provide education, literacy, career development, cultural enrichment, and lifelong learning. The Foundation strives to benefit, promote, support, encourage, and generally enhance the programs and facilities of the library; provide financial assistance and support for specific library programs and projects; and assist the library’s Board of Trustees in making its programs and facilities more valuable to the community. 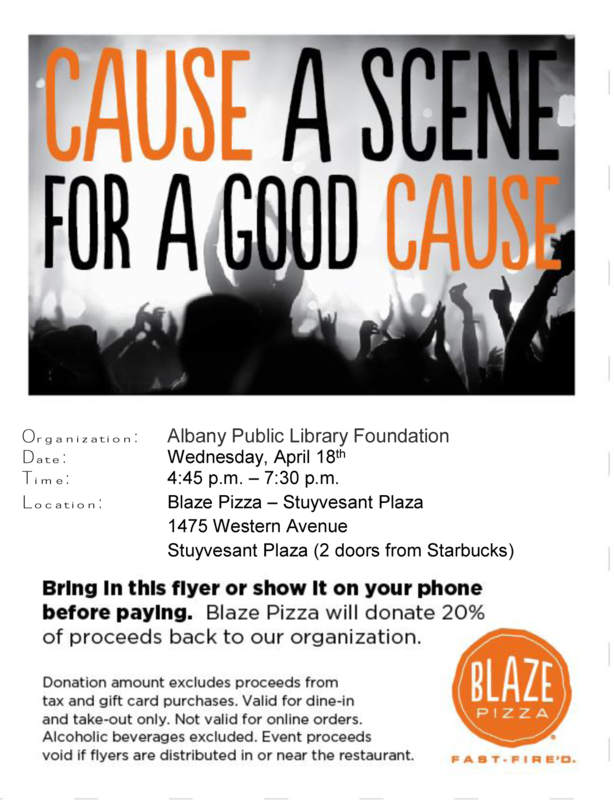 The Albany Public Library Foundation is a 501 (c) (3) nonprofit corporation that was established in 1998 and is governed by its own board of directors.